sweet soy sauce, lime, emping melinjo (type of crackers) and sambal (optional). 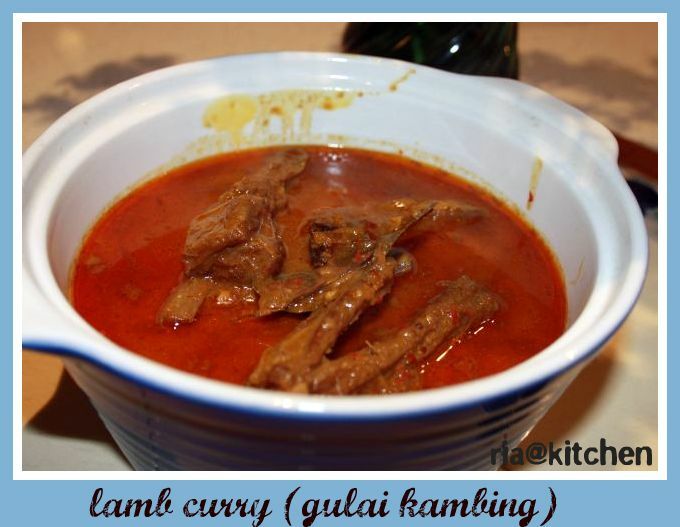 Boil the meat in a big sauce pan together with nutmeg, cloves, cinnamon stick, kafir lime leaves and salt until tender. Meanwhile, fry the paste with oil in different pan, for 2 minutes, then add the coconut milk, keep stirring until all blend together. Turn off and add the mixed paste into the boiling meat. Cook for about 5 or 10 minutes, stirring occasionally. 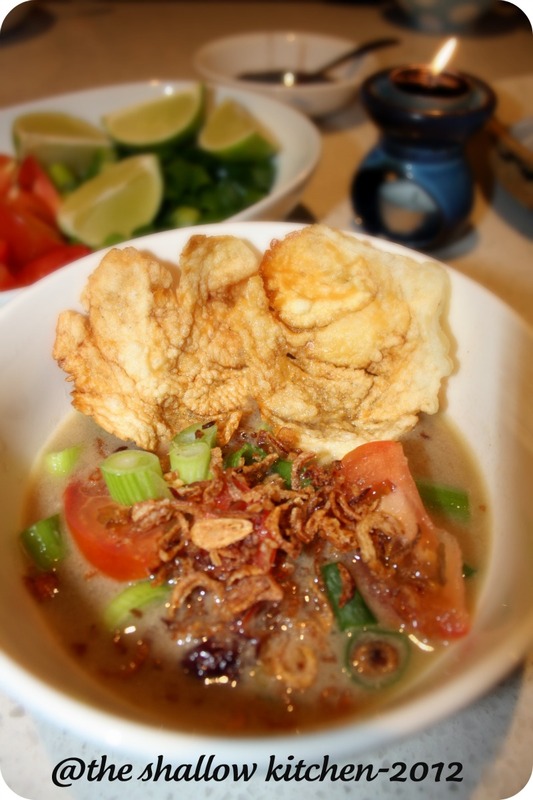 To serve: put soto into the bowl, garnish with tomatoes, spring onion, fried onion, emping, add sweet soy sauce, and a squeezed of lime. Can be eat with steam rice too. You can buy emping melinjo and the fried onion at the Asian groceries shop. In the original Indonesian way, they also add any other stomach organs of the cow for example lung, intestine, heart, liver, etc. But, I like just the meat, thanks! I don’t remember if I’ve had posted this dish or not. Anyway since I haven’t been posting anything in here yet for quite a long period so I decided to re-post this recipe again. 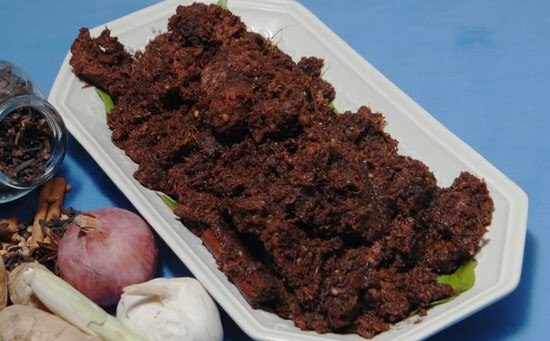 Rendang is one of famous and popular dish in Indonesia. It is a traditional dish of West Sumatra. 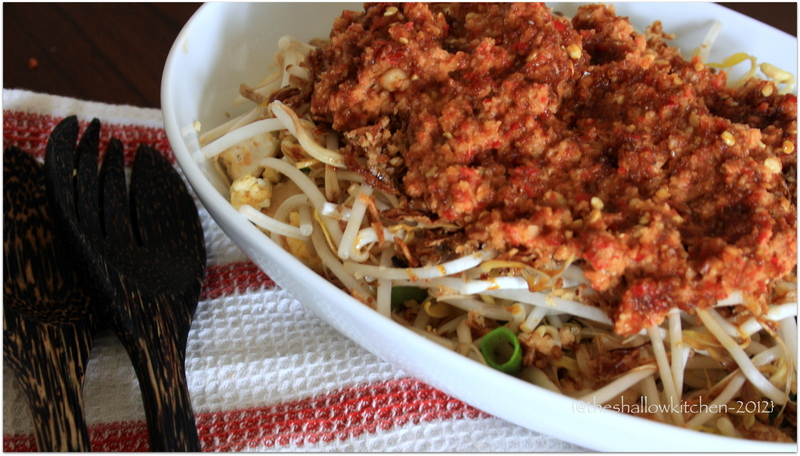 My father is from Padang, West Sumatra, so I was introduced to this dish since I was little. When Lebaran or Idul Fitri (end of Ramadhan) comes, rendang is eaten with lemang (glutinous rice cooked in coconut milk inside segments of bamboo). Originally this recipe I got it from my friend’s mother-in-law and since then I always use this recipe. 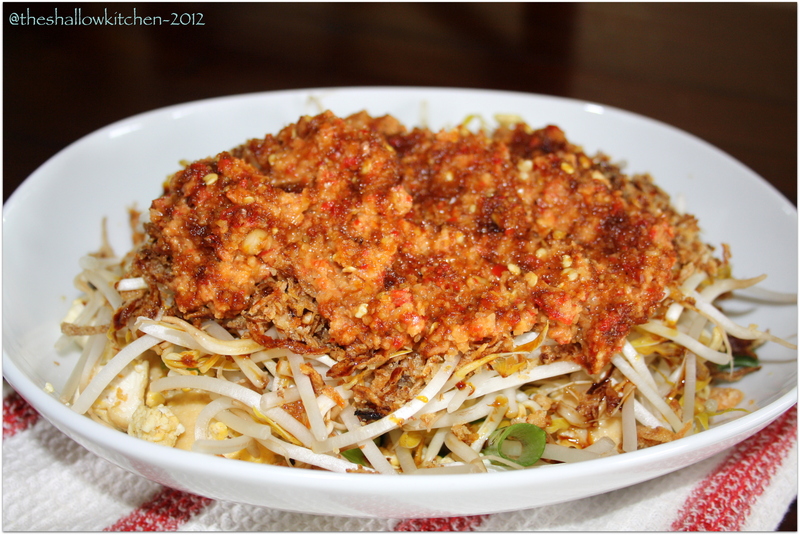 The spicing is very simple and it has always given me good result. 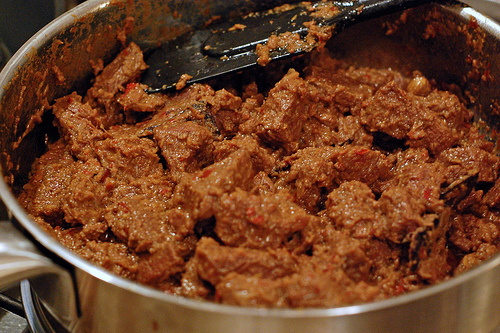 Rendang can be made with other meat besides the traditional beef. My brother in law tried it with kangaroo. Mostly the ingredients are fresh, except for the coconut milk and desiccated coconut. If you can be bothered you can find the whole fresh coconut either in the market or sometimes Wollies has it too. I have tried instant rendang that you can find in big supermarket or small delicatessen but I have to say that the flavour is far from the real thing. Making rendang from scratch though time consuming but it’s easy and doesn’t need constant attention. Basically the meat is cut into chunky cubes then boiled in the large pots, not in the water but in spiced coconut milk, which slowly penetrated the meat and give it a delicious flavour. 150 gr desiccated coconut, light fry without oil, until it browns, be careful not to burn it. Put shallots, garlic, chillies, ginger, turmeric, galangal in a blender and puree until smooth. Heat oil in a large saucepan and cook this paste just about 2 minutes then add the meat, stir the contents of the pan and covered until the meat get juicy. Add the lemongrass and kafir lime leaves, and the desiccated coconut and mixed altogether. Then add the coconut milk and stir for 2 or 3 minutes. Reduced heat, cook for 45 minutes, cover, stirring occasionally. Add salt and pepper to taste. From now on the rendang needs to be stirred frequently. When the coconut oil becomes thick and brown, stir continuously for about 15 minutes until the oil more less completely absorbed by the meat. Serve hot with rice. 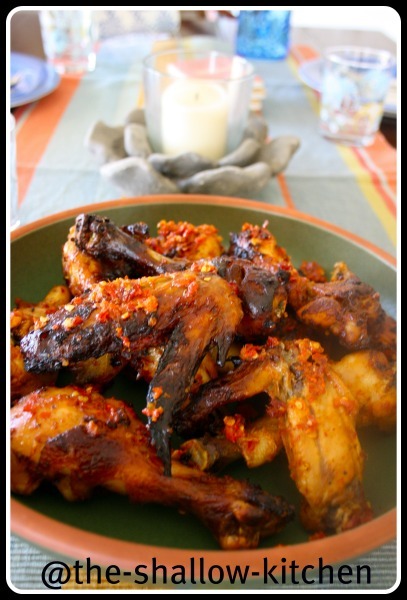 Ayam rica-rica is Manado dish. Rica in Manado means chilli. So, basically is chicken cook with lots of chillies! Wash chickens, rub with salt, pepper, and lemon juice. Put aside. 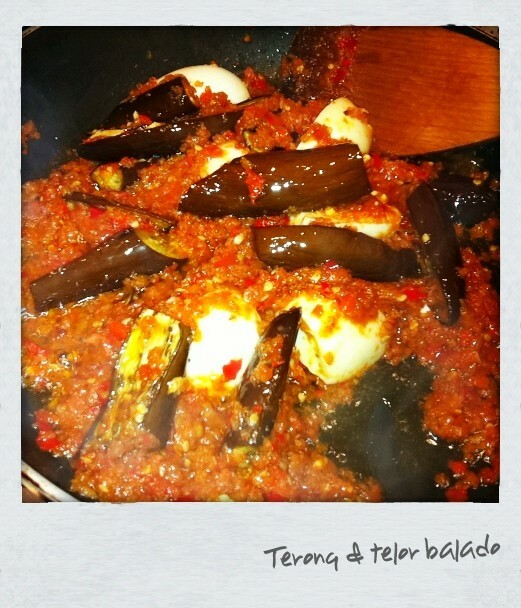 Using food processor, blend altogether chillies, shallots, ginger, and tomatoes. Marinate chicken with the mixtured for 1 or 2 hours, you can marinate the night before too and put in the fridge. Set oven to 200 C degree and cook marinated chicken in the oven tray for 30 minutes. Don’t forget to turn the other side up. Chicken is cook when its flesh not pink anymore. 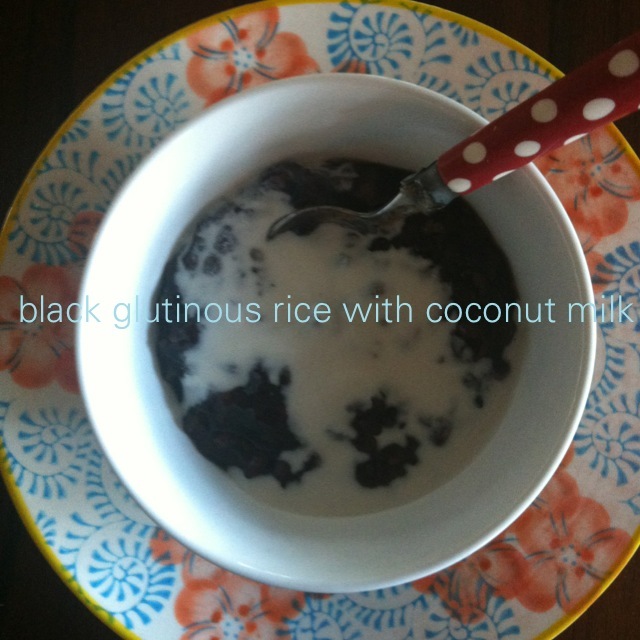 Serve with steamed rice and cucumber.